Production is now underway on the new action comedy series, Team Kaylie, created by Emmy Award winning producer Tracy Bitterolf (Emma Approved). 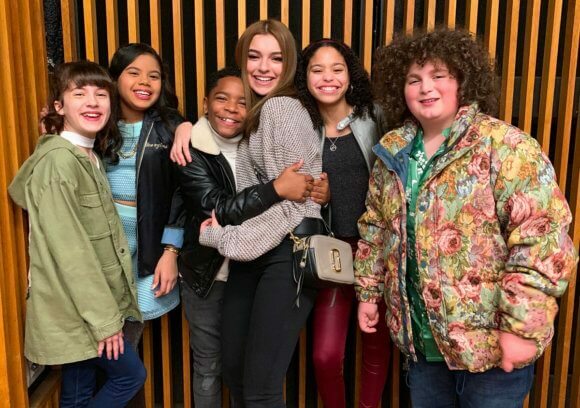 Team Kaylie is a Netflix production created by Bitterolf and developed by Emmy nominated producer Pamela Eells O’Connell (Jessie, Bunk’d). Eells O’Connell is also the first season showrunner and serves as an executive producer. Series showrunner Pamela Eells O’Connell began her career in television as a story editor on Family Matters. She’s been involved as an executive producer on Mad About You, The Nanny, Married with Children, and Ellen. Eells O’Connell recently created Disney’s Jessie and Bunk’d. Alison Fernandez (Once Upon a Time) as Amber, a tough, impulsive, and street smart student leader of the Wilderness Club, who is less than thrilled by Kaylie’s presence. Symera Jackson (Disney Channel’s Sydney To The Max) as Jackie, a straight A-student and rule follower who lives to people please and get into an Ivy League college. Elie Samouhi (Bizaardvark) as Chewy, a bumbling class clown who stumbles to the beat of his own drum. Kai Calhoun as Ray Ray, a pop-culture vulture who is fabulous, and he knows it. He worships Kaylie almost as much as her wardrobe. Eliza Pryor (Alexa & Katie) as Valeria, a would-be witch whose spells are almost as bad as her people skills.